Special symbols are used on a drawing to specify where welds are to be located, the type of joint to be used, as well as the size and amount of weld metal to be deposited in the joint. These symbols have been stan­dardized by the American Welding Society (AWS). You will come into contact with these symbols anytime you do a welding job from a set of blueprints. You need to have a working knowledge of the basic weld symbols and the standard location of all the elements of a welding symbol. 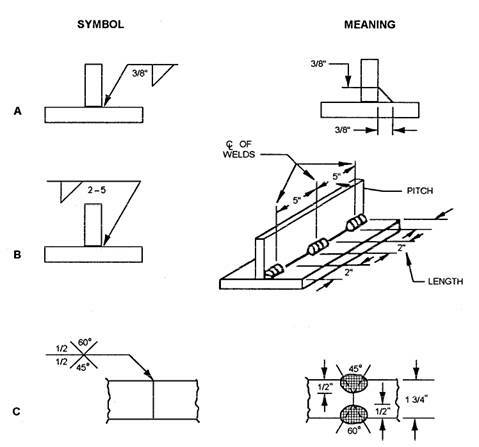 Figure 3-45.-Weld symbols applied to reference line. Figure 3-47.-Arrowhead indicates beveled plate. symbol is only part of the information required in the welding symbol. The term welding symbol refers to the total symbol, which includes all information needed to specify the weld(s) required. Figure 3-45 shows how a weld symbol is applied to the reference line. Notice that the vertical leg of the weld symbol is shown drawn to the left of the slanted leg. 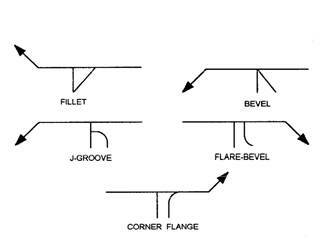 Regardless of whether the symbol is for a fillet, bevel, J-groove, or flare-bevel weld, the vertical leg is always drawn to the left. 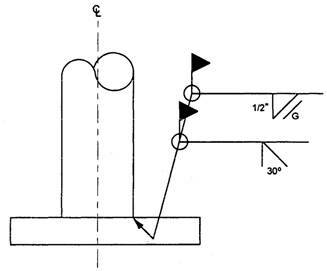 Figure 3-46 shows the significance of the positions of the weld symbols position on the reference line. In view A the weld symbol is on the lower side of the reference line that is termed the arrow side. View B shows a weld symbol on the upper side of the reference line that is termed the other side. When weld symbols are placed on both sides of the reference line, welds must be made on both sides of the joint (view C). When only one edge of a joint is to be beveled, it is necessary to show which member is to be beveled. When such a joint is specified, the arrow of the welding symbol points with a definite break toward the member to be beveled. This is shown in figure 3-47. Figure 3-48 shows other elements that may be added to a welding symbol. 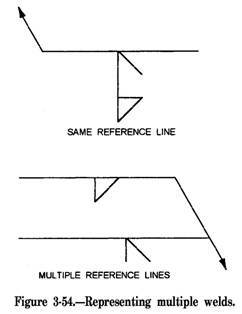 The information applied to the reference line on a welding symbol is read from left to right regardless of the direction of the arrow. In figure 3-48, notice there are designated locations for the size, length, pitch (center-to-center spacing), groove angle, and root opening of a weld. These loca­tions are determined by the side of the reference line on which the weld symbol is placed. Figure 3-49 shows how dimensions are applied to symbols. Figure 3-48.-Elements of a welding symbol. Figure 3-49.-Dimensions applied to weld symbols. 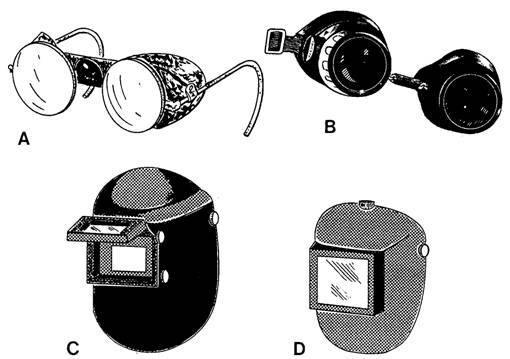 Figure 3-50 shows the meaning of various welding dimension symbols. Notice that the size of a weld is shown on the left side of the weld symbol (fig. 3-50, view A). The length and pitch of a fillet weld are indicated on the right side of the weld symbol. View B shows a tee joint with 2-inch intermittent fillet welds that are 5 inches apart, on center. The size of a groove weld is shown in view C. Both sides are 1/2 inch, but note that the 60-degree groove is on the other side of the joint and the 45-degree groove is on the arrow side. In addition to basic weld symbols, a set of supple­mentary symbols may be added to a welding symbol. Some of the most common supplementary symbols are shown in figure 3-51. 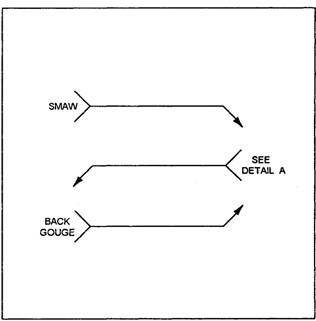 Contour symbols are used with weld symbols to show how the face of the weld is to be formed. In addition to contour symbols, finish symbols are used to indicate the method to use for forming the contour of the weld. When a finish symbol is used, it shows the method of finish, not the degree of finish; for example, a C is used to indicate finish by chipping, an M means machin­ing, and a G indicates grinding. 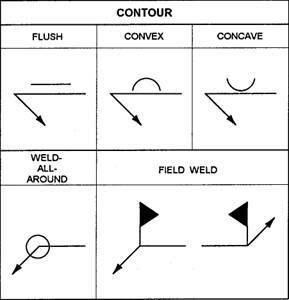 Figure 3-52 shows how contour and finish symbols are applied to a welding symbol. 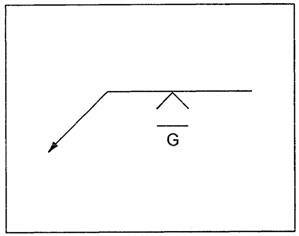 This figure shows that the weld is to be ground flush. Also, notice that the symbols are placed on the same side of the reference line as the weld symbol. Figure 3-52.-Finish and contour symbols. Figure 3-53.-Specifying additional welding information. Another supplementary symbol shown in figure 3-51 is the weld-all-around symbol. When this symbol is placed on a welding symbol, welds are to continue all around the joint. 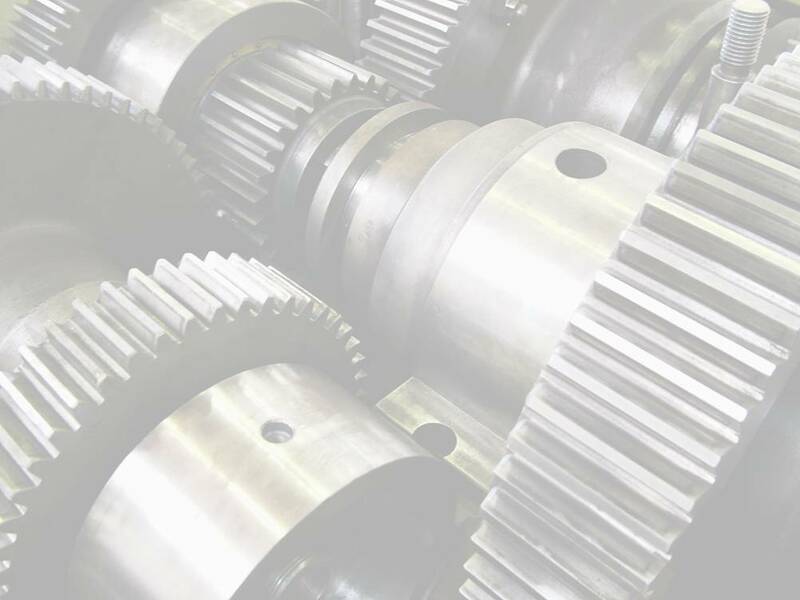 Welds that cannot be made in the shop are identified as field welds. Afield weld symbol is shown in figure 3-51. This symbol is a black flag that points toward the tail of the welding symbol. Figure 3-55.-Example of welding symbol in use. fig. 3-53.) If additional information is not needed, then the tail is omitted. When you are fabricating a metal part, there are times when more than one type of weld is needed on the same joint; for example, a joint may require both a bevel groove weld and a fillet weld. Two methods of illustrat­ing these weld symbols are shown in figure 3-54. 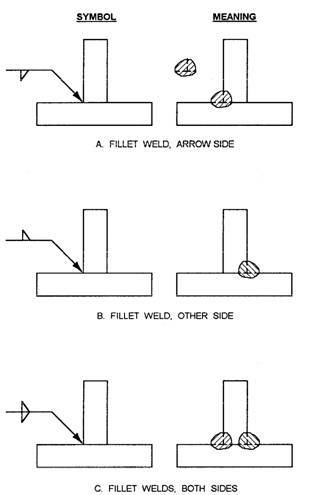 Note that in each welding symbol, the bevel groove weld is to be completed first, followed by the fillet weld. steel pipe column that is to be welded to a baseplate. The symbol tells the welder that the pipe is to be beveled at a 30-degree angle followed by a bevel groove weld all around the joint. This is followed by a 1/2-inch fillet weld that is also welded all around the joint. Finally, finish the fillet weld by grinding it to a flush contour. 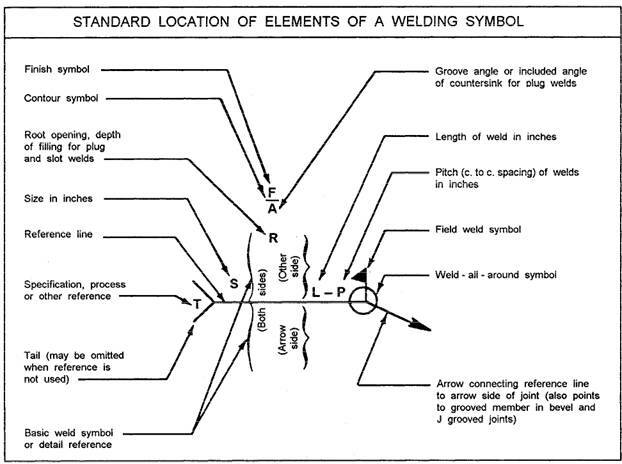 As the field weld symbol indicates, all welds are to be accomplished in the field. For additional information about welding symbols, refer to Symbols for Welding and Nondestructive Test­ing, ANSI/AWS A2.4-86.